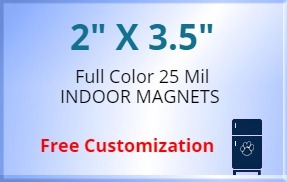 Customized 2x 3.5 square shaped business card magnets -25 mil is one of our best sellers because marketers find it affordable and extremely powerful, too. You can get it customized with branding information and contact information or any other special information at zero additional costs. This business card magnet offers good return on investments when employed for indoor marketing. It can remain affixed to its surface, unless removed forcibly. This business card magnet can be availed in cost effective prices, if you are ordering them in bulk. Request a quote to know your share of price benefits on bulk orders of promotional 2x3.5 business card magnets – 25 MIL.